Will these fit on the back of the car? I am trying to get an 11" tire in the back since I'm supercharged now and tired of just spinning. Fronts will contact suspension I believe. a 9.5" +40et will come close to contacting but will clear. Not positive on the rears, but I don't think anyone has fit an 11" wheel without pulling the fenders. I have 9.5" +40 TSWs on my front, but with BC coilovers. Clears by maybe half an inch. Yeah, I know. I had 20x9.5" +40et on my stock suspension G8 for a while, cleared fine with a 275/30/20. Is there a 10.5" rim/tire that could fit in the back? Would an 11" work but possibly just stick out of the fender well? If you're willing to have wheel and tire stick out from behind the vehicle than anything can fit. The wheel wells on the G8 are rather small, and over 285mm with proper offset to sit in the fender and not contact anything starts getting hard. Rolling fenders usually gives a few more MM to play with, but you'll need to seriously pull fenders to fit something over that. If we add a 5mm spacer to a 35mm offset wheel, the new offset would be 30mm not 40mm? Am i right? If so adding a 5mm spacer to a 45 makes it a 40. Last edited by RaptorGXP; 03-11-2019 at 10:34 PM. EDIT: You are correct when talking about positive offset wheels. Reverse is true for negative offsets (but you don't need to worry about those here). Looking at buying the 4 pot brembos for the front. I am running the 19x8.5 Regal GS wheels with 45mm offset. Will they clear, or do I need a spacer and longer studs? Sorry in advance. I've been reading through this and sent a member or 2 a message with similar wheels but I thought I'd ask here. Am i going to run into any clearance issues with a 25 offset front and a 39 offset rear(rear im pretty sure is fine). I'm mostly concerned with the front wheels being too close to the suspension or looking weird in the wheel well. I feel like I'm going to be ok but my wheel guy is MIA for a few days so I'm trying to do some homework. PM me if you have a trunk liner for sale! OEM SS Wheels are 8.5" and 9", Also 19" in diameter. If you're talking about the Holden optional wheels, I don't know the specs of those. But OEM SS Wheels will fit without issue. That's definitely different then. Not quite sure on that answer unfortunately. 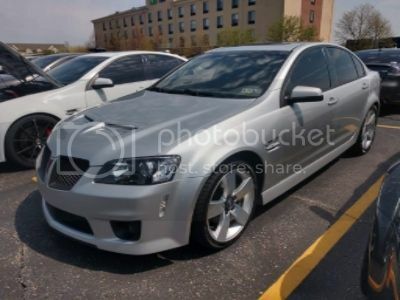 I've seen G8s with the 6th gen wheels, they appear to fit the same as 5th gen, not sure if they had fenders rolled or not. thx. I feel like theyre not that much diff than the 2010s dimensions-wise. the offset is a lil different but nothing too drastic.